Ph.D. candidate in Cultural Anthropology, Washington State University, Pullman, WA, USA.MSc. Environmental Anthropology 2010, University of Kent at Canterbury, UK.Licenciatura en Biología 2004, Universidad Mayor de San Andrés, La Paz, Bolivia. Since 2016 I have been an instructor for introductory courses in anthropology at Washington State University. In the past, I taught courses in Ethnobiology for undergraduate and graduate levels in Bolivia. I also participated in training indigenous community members to create community research teams to engage in ethnobiological research. In my teaching I cover a wide range of topics from ethnobiological and anthropological theory to issues regarding biocultural diversity, and sustainable and traditional uses of natural resources; I emphasize research methods and ethical approaches to collaborative research with communities. In my classes I encourage the active participation of students, I aim for engaging with students in hands-on activities and sharing experiences. I provide students with a space to develop their own interests and curiosities in research: topics that they feel passionate about, are respectful, and align with local norms and traditions. I encourage students to participate in both individual and team research. I have extensive ethnobiological research experience with indigenous peoples in Bolivian Amazonia andthe high Andes, as well as with indigenous communities of southern Mexico and northern Guatemala. My research has an emphasis on the fields of ethnobotany, ethnozoology, and ethnoecology. I am interested and feel passionate about collaborative approaches to research and topics ranging from traditional uses of plants and animals, community conservation, traditional ways for hunting and fishing, biocultural diversity, ethics in research, natural resource management, collaborative video and more. As a result of my commitment to collaborate with indigenous peoples, I am also a founding member of the Latin American Society of Ethnobiology (SOLAE), and currently serve as a coordinator for the Ethics Committee for SOLAE. Medinaceli A. & Cuchisama and San Luis Chico Tsimane’ villages (in press). Ethnographic video documentary: Fabricating amazonian bows and arrows with the Tsimane’ from Bolivia. Medinaceli A. & R. Quinlan (in press). Targeting firearms: Effects on the introduction of new technologies into traditional Tsimane’ hunting in Bolivian Amazonia. Flores, K., Medinaceli, A., & Thiel, A. (2016). How Forests Think: Toward an Anthropology Beyond the Human. By Eduardo Kohn. 2013. University of California Press, Berkeley. 288 pp. Ethnobiology Letters, 7(1), 53–54. doi:http://dx.doi.org/10.14237/ebl.7.1.2016.550. Ibarra, T. T, C. Del Campo, A. Barreau, A. Medinaceli, I. C. Camacho, R. Puri y G. Martin. 2011. 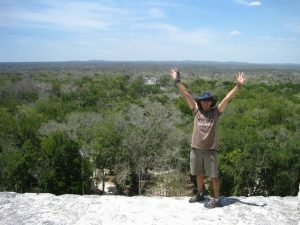 Etnoecología Chinanteca: Conocimiento, práctica y creencias sobre fauna y cacería en un área de conservación comunitaria de la Chinantla, Oaxaca, México. Etnobiología. Vol. 9. Pp. 37-53. Ruíz-Mallén, I., Porter-Bolland, L., Boada, M, Chablé, E, Fernández-Tarrio, R., Fuentes, K., Medinaceli, A., Méndez, E., Sánchez-González, M.C., Camacho-Benavides, C.I., Equipo Conservcom, Reyes-García, V. 2011. Experiencias de Pagos por Servicios Ambientales: Estudiocomparativo en el sureste mexicano. Spanish Journal of Rural Development, Vol. II (Special 1): 55-66. Medinaceli, A. Ethnozoology and mammal folk classification of the Chinantec people of Santiago Tlatepusco in Oaxaca, México. 2009. Masters degree dissertation in Environmental Anthropology. University of Kent, Canterbury, UK. Medinaceli, A. Animales utilizados en la medicina tradicional de dos comunidades Tsimane’ en La Paz-Beni, Bolivia. 2004. Tesis de licenciatura. Universidad Mayor de San Andrés, La Paz, Bolivia.